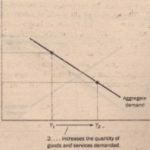 The downward slope of the aggregate-demand curve shows that a fall in the price quantity of goods and services demanded. Many other factors, however. Services demanded at a given price level. When one of these other factors curve shifts. Let’s consider some examples of events that shift aggregate demand. We can categorize them according which component of spending is most directly affected. emed about saving for retirement and, as a result, reduce their current consumption. Because the tiny of goods and services demanded at any price level is lower, the aggregate-demand curve shifts to left. Conversely, imagine that a stock-market boom makes people wealthier and less concerned about inning. 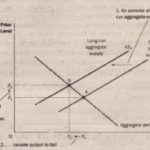 The resulting increase in consumer spending means a greater quantity of goods and services deed at any given price level, so the aggregate-demand curve shifts to the right. Shift Arising from Changes in Investment Any event that changes how much firms want to invest price level also shifts the aggregate-demand curve. For instance, imagine that the computer introduces a faster line of computers, and many firms decide to invest in new computer systems. the quantity of goods and services demanded at any price level is higher, the aggregate-demand to the right. Conversely, if firms become pessimistic about future business conditions, they k on investment spending, shifting the aggregate-demand curve to the left. hey can also influence aggregate demand through investment. As we saw in Chapter 26, tax credit (a tax rebate tied to a firm’s investment spending) increases the quantity of cat goods that firms demand at any given interest rate. It therefore shifts the -demand right. The repeal of an investment tax credit reduces investment and shifts the to the left. Shift Arising from Changes in Government Purchases The most direct way that policymakers I&i~:ate-demand curve is through government purchases. For example, suppose Congress purchases of new weapons systems. Because the quantity of goods and services price level is lower, the aggregate-demand curve shifts to the left. 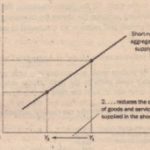 Conversely, if state building more highways, the result is a greater quantity of goods and services demanded so the aggregate-demand curve shifts to the right. Shift Arising from Changes in Net Exports Any event that changes net exports for a given price aggregate demand For instance, when Europe experiences a recession, it buys fewer goods states. This reduces U.S. net exports at every price level and shifts the aggregate-demand . economy to the left. When Europe recovers from its recession, it starts buying U.S. e aggregate-demand curve shifts to the right times change because international speculators cause movements in the exchange rate that these speculators lose confidence in foreign economies and want to move some the U.S. economy. In doing so, they bid up the value of the U.S. dollar in the foreign. Summary In the next chapter, we analyze the aggregate-demand curve in more detail. There we examine more precisely how the tools of monetary and fiscal policy can shift aggregate demand and whether policymakers should use these tools that purpose. At this point, however, you should have some idea about why the aggregate-demand curve slopes downward and what kinds of events and policies scan shift this curve. Table 1 summarizes what we have learned so far.